AFTER A TURBULENT FEW WEEKS the election is finally over, with a hung parliament a certainty as we go to press. What will happen next in terms of configuring government is still anybody’s guess – and has been, during the hours of tv coverage through the night. All we know is that a great deal of negotiation must take place before anything approaching a serious administration can take shape and start to make decisions that will affect us. 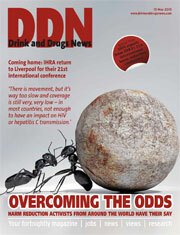 This issue of DDN is going to new MPs as they take up their places in the new parliament. If they get as far as reading it, they may be surprised at the contents. What, after all, does the term ‘harm reduction’ mean to anyone outside the substance misuse field, other than harm reduction to the public by protecting them from drug users? They may be surprised to consider such matters in terms of public health – and of life and death to people in the grip of addiction. Such matters haven’t exactly featured prominently in any party’s manifesto, so we hope the magazine might offer new insight into complicated lives and inspire them to take an interest. Likewise, we hope the issue will be informative to all our readers, not just those with an obvious harm reduction remit. The IHRA conference is an opportunity to learn from experience elsewhere, informing our responses to international drug policy and its many extremes, while giving an opportunity to reassess priorities back home. During a debate on our treatment system in the UK, Nick Barton of Action on Addiction made the point that whatever we are passionate about in this field, we should all have the shared goal of maximising wellbeing and quality of life. Polarisation would not end ‘until each party looks at its own deficiencies instead of pointing the finger excitedly at the failings of the other’, he said. He might equally have been talking to the political leaders – but it’s a strong and dignified message for this field as we wait for the new political landscape to take shape.